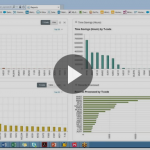 Streamlining your master data : save more than time. Recently I presented to two different companies on how we could help enable them to create Material Master Data. Both meetings showed that when time savings is the top benefit, the returns for the company are extremely high. First, I met with the SAP users team at a small company, with a turnover below 100 Million Euros, using SAP All-in-One. 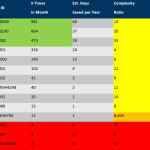 The first calculation didn’t show a big enhancement at the company level. Their number of products is low (around 300, with 80 new products each year), and the expected savings was a measly 20 hours per year. Inbound Orders encounter issues: When deliveries arrive at the warehouse, the dock is usually oversaturated, which prevents an easy drop-off. This slows other deliveries as well as overall production. The vendors are upset because of delays, and the accounting team has to stop their work to jump in to solve the issues. As a result, other tasks are not completed on time, and employees have to explain what happened and why delays are occurring. While we’re not able to identify an exact cost, the delayed deliveries, extra stress and work for all employees has increased processing time. Most of the time, the issues are due to “missed” data in a field. Outbound documents aren’t complete: Retailers have enforced penalty schemes, to cover their costs, to ensure deliveries are correctly planned and executed. An issue with a delivery can cost as much as 167 Euros per pallet. For example, a trailer containing 35 pallets could incur a total penalty of over 5000 Euros. As a result, margins on deliveries are often lost. In these cases, again, the cause is linked to missing or wrong data. 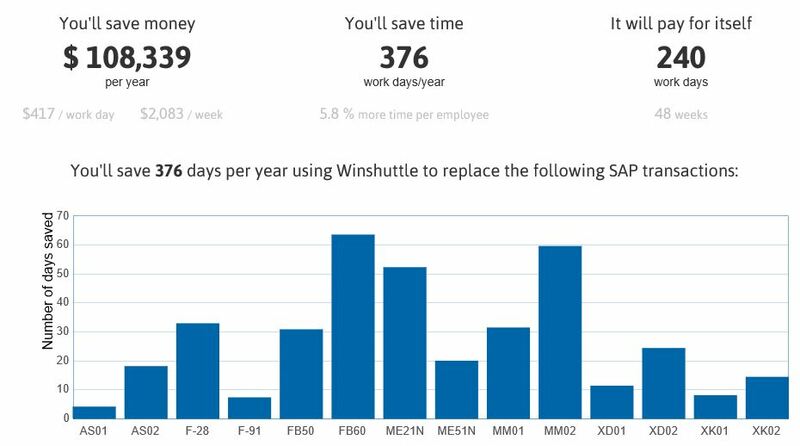 With these figures, it becomes very easy to understand how Winshuttle can contribute to margin enhancements, even with smaller companies, because data quality has a clear value for them. The second meeting was with a global company with thousands of employees and billions in yearly profits. Based on our ROI calculator and our discussion, we discovered that the potential savings on transactions MM01 and MM02 would be a combined 820 hours per month. Upon receiving this news their response was enthusiastic: “We make 90% of our master data maintenance during a four month period. Saving one month out of four is huge.” Accelerating the process in such a large proportion will be a great benefit. Our customers often comment that when processes are streamlined the freed time allows for other processes to be streamlined. 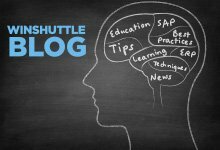 A single discovery discussion with us can help you to understand why Winshuttle is a great solution for your master data. To receive your own free assessment, you’ll need to provide a few minor inputs, such as the number of employees and the transaction codes used. Our ROI calculator is able to calculate SAP benefits based on your transactions volumes in only a few minutes. For a greater insight, you can become one of the more than 1,000 customers who have participated in our Business Value Assessment (BVA). Our BVA is a set of diagnostic and predictive models that help customers maximize their SAP transactions by analyzing the actual usage of an organization’s SAP system and identify potential areas of improvement. Check out our BVA and ROI Calculator SlideShare, which explains more about the process and benefits, including some past examples. David is pre-sales consultant at Winshuttle France since 2013. He is a specialist in Business Intelligence. As he graduated in business and controlling, his main concern is how companies can improve their processes and measure their return. This marathon runner also knows when it is worth tracking more, and when it is necessary to think in order to make leaps.